Rory has been doing music in one way or another all his life. To begin with, there was a piano in the family home in Deep River and he noodled on the instrument almost daily till he left home for University. While in Deep River he took lessons on the Great Highland Bagpipe and the Saxophone. In addition he played clarinet and ukulele in two folk groups –self taught on both. While at University he took up guitar – learning on his roommate’s instrument. The guitar has been a constant in his life ever since. Since 2000, Rory has been most interested in combining the music of the bagpipe with other instruments He has produced 3 CD’s of pipe music both traditional and with other instruments Two are available in their entirety elsewhere on this website. The most recent, “The World Through a Piper’s Fingers” features tunes, genres and songs that have never seen pipes: Bob Marley, Chuck Berry, Cajun, Calypso inter alia. Rory also plays in the musical collective Gordon’s Acoustic Living Room founded in 2004 and now it its 10th year of playing monthly gigs at the FreeTimes Café at College and Spadina. 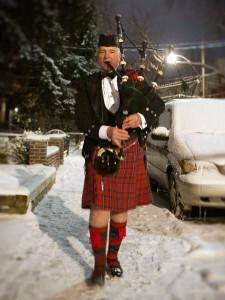 He has played in several Irish bands, for various tracks on CD’s of other musicians, for countless academic processions, weddings, funerals and plays pipes with organ in many downtown churches. But the musical position of which he is most proud is being appointed Piper to the Earl of Caithness, Hereditary Chief of Clan Sinclair..
Rory makes ends meet as a residential general contractor in downtown Toronto.